Downtown East dispute: Does the City Council have the authority to create a park? 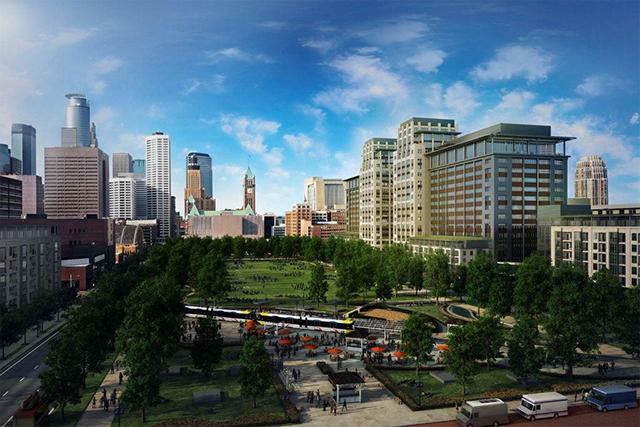 The potential park would be part of a $400 million project known as Downtown East. Which Minneapolis group has the authority to acquire land for a park — the City Council or the Park Board? That question was before Hennepin County District Judge Mel Dickstein on Wednesday as part of a lawsuit challenging the city’s role in the Downtown East project. The City Council’s authority to buy the land is being challenged by former City Council President Paul Ostrow and former mayoral candidates Stephanie Woodruff and Dan Cohen. They also are questioning the City Council’s use of Port Authority powers. Last week, Judge Dickstein ruled against portions of the Ostrow group’s complaint that the city’s plan to build a parking ramp and acquire land for a park was not in violation of city spending limits as outlined in the legislation for the new Vikings Stadium. On Wednesday, the judge expressed concern that it might be too early in the process to decide which group has the authority to acquire and operate a city park. Ostrow, an attorney representing himself, Woodruff and Cohen, argued that the Dec. 27 deadline for sale of the land and sale of city bonds requires the court to act promptly. “Once the contract is signed, no further action is possible,” Ostrow told the judge, adding that the developer first approached the Park and Recreation Board about acquiring the two-block park but was told they had no funds to purchase the property. Purchase price for the land is in the range of $17 million to $20 million. The potential park would be part of a $400 million project known as Downtown East, which would involve five blocks adjacent to the new Vikings stadium on land currently owned by the Star Tribune. Ryan Cos., the developer, expects to sign a contract with Wells Fargo to occupy two office towers in the project by the Dec. 27 deadline. Ostrow argued that the City Charter clearly states that the job of operating the city parks belongs to the Park Board and that letting the City Council acquire or operate parks is a violation of voters’ rights. “When they vote for the Park Board, they are voting for folks who run the parks,” said Ostrow, who said his understanding is that both the contract for the sale of land and the sale of bonds will require the City Council to take ownership of the proposed park property. “The City Council has directed staff to work with the Park Board,” Deputy City Attorney Peter Ginder told the judge. He argued that the City Council has the authority to acquire land and transfer it to the Park Board. He also said that the City Council and the Park Board have a long history of cooperation. The City Council expects to sell bonds to finance the purchase of the proposed parkland, using its Port Authority powers that allow creation of a development district. The state statute, which establishes those powers, specifically names the City Council, not the Park Board, as the government body entitled to use Port Authority powers. This means that the Park Board is not eligible to establish a development district for the purpose of purchasing “marginal” land. “The Park Board has a history of taking land from the city,” said Park Board attorney Brian Rice, who argued that the job of the Park Board is to operate the city parks. “The City has purchased Nicollet Island, portions of that, and turned it over to the Park Board for operation,” said City Attorney Susan Segal following the hearing. She also cited the long history of the City Council and the Park Board working together to acquire and operate parks. “This is about the rights of the residents of the city, for their government to be transparent and open,” Ostrow said. The “need for a process that is consistent with the Charter is not anything that can be negotiated away,” he added. Judge Dickstein said he expects to rule on the matter in a timely fashion. This entry was posted in Downtown East Park on December 22, 2013 by citoyen1789.